When your guests walk in, make sure the first thing they feel is comfortable. Light a few candles around the entry way, make sure the surrounding lamps are on, and have easy music playing in the background. For us, we love turning on a James Arthur or James Bay vinyl on our record player. It's soothing and instantly gives our entry way a cozy, vintage vibe that we love. We use our grill almost every night during the Summer + Fall, but it's especially helpful when entertaining. When the weather is warm and the drinks are flowing, more often than not, we want to be outside. Rather than staying in the kitchen to finish dinner, you can be outside with your guests - multitasking. J loves to grill and loves the company outside while doing so even more. 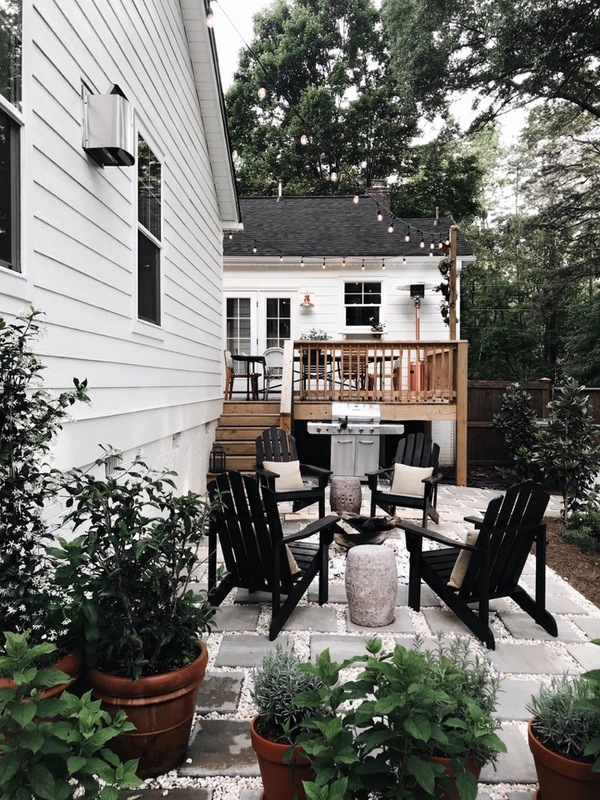 We were so intentional about making our backyard private, comfortable, and perfect for happy hours! THROW IT ALL ON THE TABLE. Once dinner is officially ready, use your favorite serving pieces to throw it all on the table. Having easy access to the food to fill and refill your plates without having to get up or go in a different room is so helpful. It also makes your guests feel even more comfortable to get seconds when it's right in front of them. Plus, who doesn't love a table full of food? I know it makes my 'it's complicated' heart happy! Also, fill a pitcher or carafe with extra water (or simply a bottle of SP like us!) to refill drinks at the table, too! It's often tempting to collect plates and start cleaning up while you're guests are still there. But, collect them and leave them in the kitchen! As much as you may want to knock it out, it will take the same amount of time after your guests leave and allows you to continue hanging out, rather than turning into the maid. I rarely let guests help us clean up, simply because I know J and I can knock out in 10-15 minutes after they leave. I would much rather start a game, have another cocktail, or make a fire in the back than hiding away in the kitchen doing dishes while friends are still over! Great ideas! I love having friends over for small get togethers! Love this! Please post some of your recipes! Looks so pretty! I love the hanging lights!